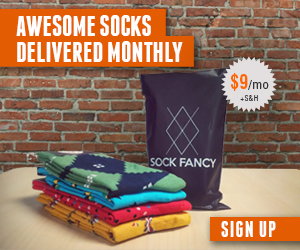 On SockClubs.com, we cover the best of subscription sock sites and online sock shopping. A recent sock merchant we found is Sock Talk — a unique way to send a message using your feet! Sock Talk is a simple concept — a pair of socks for $6.99 that make a statement. Each pair of Sock Talk socks comes with printed words on each sock. This is a great idea for many different occasions such as weddings, gifts for friends and co-workers, or for the holidays. They have funny sayings, romantic words, sports themed socks, and more. And Sock Talk carries socks for both men and women. What are some example Sock Talk sayings? They include “I love my Wife” or “Fantasy Football” for men, and “Baby Bump” or “Mom Life” for women. Sock Talk doesn’t yet have a subscription sock of the month club, but you can very easily order many pairs of socks to keep your sock drawer inspired!